CHARLOTTE, N.C. -- Aerial and ground level inspections of Duke Energy's L.V. Sutton Plant in Wilmington confirm that conditions at the plant are stable during ongoing historic flooding caused by Hurricane Florence. 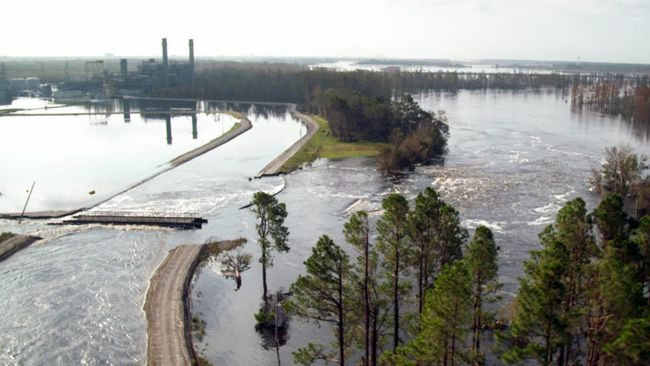 The Cape Fear River continues to overtop the northern section of a cooling lake dam and is exiting through a breach on the southern end of the cooling lake impoundment. Given the historic level of flooding on the river, the water moving both into and out of the lake will not contribute to a measurable change to water levels in the area. The company is bringing in additional construction materials from across the state to repair the breach as soon as flood waters recede and it is safe to do so. On Friday, flood waters entered the natural gas plant prompting employees to safely shut down the facility. There is an adequate power supply to serve customers. There are two coal ash basins at the site, and their dams remain stable. Ash in the 1971 basin that was being excavated is being contained by a steel wall, and the 1984 basin has not been affected. With ash basins stable, engineers at the site are focused on a repair plan that also preserves as much water as possible in Sutton Lake to support future plant operations and recreation as it recovers from flooding. As announced yesterday, cenospheres are moving into the Cape Fear River. Cenospheres are lightweight, hollow beads comprised of alumina and silica that are a byproduct of coal combustion. Importantly, cenospheres have different chemical makeup than fly ash, bottom ash, boiler slag and other materials, which are the focus of regulation and concern. Water sampling is being conducted to determine if there is any impact to water quality and the company continues to provide regular updates to local, state and federal regulators. Water sampling, transportation and analysis in our state-certified lab takes approximately 24 hours to complete. Sutton Lake is an 1,100-acre man-made reservoir constructed in 1972 to supply cooling water to the Sutton power plant. The cooling lake does not store coal ash. The company is already repairing the lined landfill, where most of the site's ash is disposed, following damage from the hurricane. As previously shared, flooding has caused the river to flow across three forested, inactive ash basins at the H.F. Lee site in Goldsboro. Those basins are normally dry, covered in forest and vegetation and do not impound water. Ongoing visual inspections show that some cenospheres were released during the flooding. It also appears that only a small amount of coal ash has been displaced, similar to the impact in the wake of Hurricane Matthew in 2016. Crews will continue to monitor the situation. The ash basins at Sutton are being excavated as part of an aggressive plan to safely close the basins across the state. Material at Sutton is being moved to a lined landfill on plant property that was applauded by environmental groups when the decision was announced.